May 12, 2001 – WWF Jakked: Steve Blackman defeated Prince Nana..
May 4, 2002–ECWA: Prince Nana defeated Scoot Andrews in a Submission match to win ECWA title! June 28, 2002–QWA: Prince Nana defeated Matt Striker. September 14, 2002–ECWA: The Amazing Red defeated Prince Nana to win ECWA Heavyweight title..
November 2, 2002–ECWA: Striker & Buck Wylde & Johnny Heartbreaker beat Prince Nana & Quiet Storm & Chris Devine..
November 2, 2002–ECWA: The SAT (Jose & Joel Maximo) & Amazing Red defeated Prince Nana & Xavier & Mega..
January 18, 2003–ECWA: Prince Nana & Xavier & Mega defeated Cheetah Master & The SAT (Jose & Joel Maximo)..
May 3, 2003–ECWA: Prince Nana defeated Japanese Pool Boy for the ECWA Mid Atlantic title in Wilmington, Delaware..
September 6, 2003–ECWA 36th Anniversary Show: Prince Nana defeated Pete Gas in Newport, Delaware..
October 4, 2003–ECWA: Cheetah Master & Louie Faraone & Bryan Russo defeated Prince Nana & Mega & Tyler Payne..
May 1, 2004–ECWA: Prince Nana defeated Ace Darling to win ECWA Mid Atlantic title in Wilmington, Delaware.. Prince Nana became the figurehead leader of a faction known as The Embassy..
May 15, 2004 – ROH: The Carnage Crew & Dunn & Marcos defeated Prince Nana & Josh Daniels & The Outkast Killahs..
November 5, 2004–Pro Wrestling Unplugged: Corporal Robinson defeated Prince Nana in Philadelphia, Pennsylvania..
December 4, 2004 – ROH: Jay Lethal defeated Prince Nana’s Weapon of Masked Destruction (Flash Flanagan under a mask)..
December 26, 2004 – ROH: Jay Lethal defeated Prince Nana’s Weapon of Mask Destruction #2..
February 12, 2005–ECWA: Prince Nana defeated Mike Fury in Newark, Delaware..
March 12, 2005–ECWA: Mega & The O.C. Boyz defeated E.S. Easton & Arch Kincaid & Prince Nana in Newark..
March 12, 2005–ECWA: Mega & Cheetah Master & Scotty Charisma beat Kodiak Bear & Frank Nastty & Prince Nana..
April 30, 2005–NWA Cyberspace: Mason Raige defeated Prince Nana..
November 5, 2005 – Ring of Honor: The Embassy defeated Generation Next in a special ROH 8-Man War! ~~~Jimmy Rave & Alex Shelley & Abyss & Prince Nana beat Austin Aries & Jack Evans & Matt Sydal & A.J. Styles..
November 29, 2005 – UXW: Buff-E and Mace defeated Kamala and Prince Nana. December 3, 2005 – ROH: Generation Next w/Jade Chung defeated The Embassy in a Steel Cage Warefare Elimination match! ~~~~~~~~~Austin Aries & Roderick Strong were the final two survivors to win the match for Generation Next! January 13, 2006–ECWA: Mike Kruel defeated John Walters w/Prince Nana to retain the ECWA Title..
May 19, 2006–WSU Title Tournament: Xavier defeated Prince Nana in the First Round of the Tournament..
May 26, 2006–Full Impact Pro: Salvatore Rinauro defeated Prince Nana..
May 27, 2006–Full Impact Pro: Ace Rockwell defeated Prince Nana by Disqualification..
July 15, 2006 – ROH: Prince Nana introduced the newest member of The Embassy……………… Salvatore Rinauro!! September 2006: Prince Nana disappeared from Ring of Honor under mysterious circumstances that were never explained..
October 13, 2007–ECWA: Prince Nana (head of RGN) fired promoter Jim Kettner (in storyline)…. October 17, 2007–NYWC: Maverick & Plazma beat Prince Nana & Mega and The Angus Brothers in a 3-WAY..
October 27, 2007–NYWC: NYWC tag team champions Plazma and Maverick defeated Prince Nana and Mega & Billy and Danny Angus in a 3-way tag team match to retain the titles. 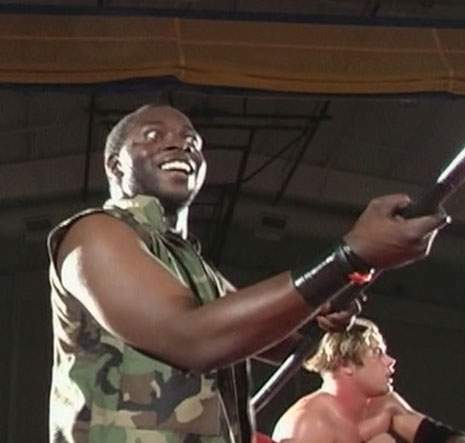 November 10, 2007–ECWA Super 8: Prince Nana won a 28-Man Rumble Match in Newark, Delaware..
December 15, 2007–NYWC: MEGA & Prince Nana defeated Plazma & Maverick to win the NYWC Tag Team titles..
January 26, 2008–NYWC: Tony Burma & Papadon vs. Dead Presidents vs. Mega & Prince Nana ended in a No Contest..
February 23, 2008 – NYWC: Mikey Whipwreck defeated Dan Dynasty and Mega and Papadon and Prince Nana and The Dead Presidents (Boog Washington & Lo Lincoln), Bruno Marciano, Mike Spinelli, Tony Burma in a 10 man tag team match to win the NYWC heavyweight title. March 1, 2008 – ECWA: Freak Nattsy defeated Prince Nana. March 29, 2008 – NYWC: NYWC tag team champions Prince Nana and Mega defeated Stockade and Syther to retain the titles. April 5, 2008 – ECWA: Prince Nana, Maifu and Saifu defeated Freak Nattsy, Bryan and Matt Logan. April 26, 2008 – NYWC: NYWC tag team champions Prince Nana and Mega defeated Benny Martinez and Spryder to retain the titles. May 10, 2008 – ECWA: Prince Nana defeated Loca Vida. May 31, 2008 – NYWC: NYWC tag team champions Prince Nana and Mega vs. Eddie Guapo and Low Ryda ended in a no contest to retain the titles. July 26, 2008 – ECWA: Maifu, Saifu and Prince Nana defeated Jim Kettner, Bryan and Matt Logan. August 2, 2008 – NYWC: Eddie Guapo and Low Ryda defeated Prince Nana and Mega & Billy and Danny Angus in a 3-way tag team match to win the tag titles. September 27, 2008 – ECWA: Aiden Chambers defeated Prince Nana. October 18, 2008 – NYWC: Prince Nana defeated Dirty JT and Joey Braggiol in a 3-way match. October 24, 2008 – Ring of Honor: Prince Nana showed up begging for a job but was dragged out of the building by security..
November 22, 2008–ECWA: Glen Osbourne defeated Prince Nana. November 28, 2008–NYWC: Prince Nana & Tony Burma defeated John Silver & Oscar The Giant. December 27, 2008 – Ring of Honor: Prince Nana once against begged for a job but was escorted out by Ring of Honor crew..
January 17, 2009 – Ring of Honor: Prince Nana showed up once more and begged for a job with Ring of Honor..
January 24, 2009–ECWA: ECWA heavyweight champion Tommy Trouble defeated Aden Chambers, Frederick Of Hollywood and Prince Nana in a 4-way match to retain the title. March 21, 2009 – ROH: Bryan Danielson & Colt Cabana defeated Bison Smith & Jimmy Rave (w/Prince Nana & Ernie Osirus)..
April 9, 2009–Ring of Honor: Colt Cabana was confronted by the Embassy’s Prince Nana and Ernie Osirus..
April 17, 2009 – Ring of Honor: Claudio Castagnoli & Jimmy Rave w/Prince Nana defeated Colt Cabana & Brent Albright..
April 18, 2009 – Ring of Honor: Brent Albright defeated Jimmy Rave w/Prince Nana by Submission with the Crowbar..
~~~LATER THAT NIGHT: Colt Cabana defeated Claudio Castagnoli with Prince Nana & Ernie Osirus watching at ringside..
April 24, 2009 – Ring of Honor: Jimmy Rave w/Prince Nana defeated Grizzly Redwood in a singles match..
April 25, 2009 – Ring of Honor: “American Dragon” Bryan Danielson defeated Jimmy Rave w/Prince Nana by referee stoppage..
May 8, 2009 – Ring of Honor: Jay Briscoe vs. Necro Butcher ended in a No Contest after the Embassy attacked the Butcher..
~~~Jimmy Rave & Claudio Castagnoli & Joey Ryan w/Prince Nana defeated Colt Cabana & Brent Albright & Erick Stevens..
May 9, 2009 – Ring of Honor: Necro Butcher & Delirious defeated Jimmy Rave & Claudio Castagnoli w/Prince Nana..
May 9, 2009 – Ring of Honor: Colt Cabana defeated Joey Ryan w/the Embassy with the Billy Goats Curse..
May 16, 2009–ECWA: Prince Nana defeated Freak Nastty. May 29, 2009–ROH HDTV Taping (Episode #13): Jimmy Rave (w/Prince Nana & the Embassy) defeated Grizzly Redwood..
May 30, 2009–ROH HDTV Taping (Ep. #17): Necro Butcher & Grizzly Redwood beat Jimmy Rave & Ernie Osiris w/Prince Nana..
~~~~~~~~~~~~~~~~~~~~Near the end of the match, The Embassy (Prince Nana & Jimmy Rave) walked out on Ernie Osirus..
July 18, 2009–ECWA: ECWA heavyweight champion Chase Del Monte defeated Prince Nana in a lumberjack match to retain the title. July 18, 2009–PWR: Aden Chambers, Freak Nastty & Glen Osbourne defeated Bazooka Joe, JJ The Crew Guy & Prince Nana. ~~~The Embassy team consisted of Jimmy Rave & Joey Ryan & Claudio Castagnoli & Bison Smith with manager Prince Nana..
September 11, 2009–ROH HDTV: Grizzly Redwood & Necro Butcher beat Prince Nana & Joey Ryan in a Beard vs. Beard Match..
September 18, 2009–Ring of Honor: Grizzly Redwood defeated Jimmy Rave w/Prince Nana by DQ..
September 19, 2009–Ring of Honor: Necro Butcher defeated Jimmy Rave w/Prince Nana in a Dog Collar match..
September 26, 2009–Ring of Honor: Claudio Castagnoli w/Prince Nana defeated Kenny Omega with a European Uppercut..
October 10, 2009–ECWA: Nick Logan defeated Prince Nana in the 1st round. November 6, 2009–ROH TV Taping: Joey Ryan w/Prince Nana & The Embassy defeated Necro Butcher in a No-DQ match..
~~~The Embassy attacked Butcher until Erick Stevens made the save but then Stevens turned on Butcher with a chair shot! November 7, 2009–Ring of Honor: Necro Butcher & Mark Briscoe vs. The Embassy (Joey Ryan & Erick Stevens) was a No Contest..
November 13, 2009–Ring of Honor: The Embassy (Erick Stevens & Joey Ryan) defeated The Super Smash Brothers (Uno & Dos)..
November 14, 2009–Ring of Honor: The Embassy (Joey Ryan & Erick Stevens) defeated The Briscoe Brothers..
December 18, 2009–Ring of Honor: The Embassy (Erick Stevens & Bison Smith w/Prince Nana) defeated Kevin Steen & El Generico..
December 19, 2009–Ring of Honor: The Embassy (Erick Stevens & Bison Smith) defeated Delirious & Pelle Primeau & Bobby Dempsey..
June 6, 2010–PWR: The Embassy (Mr. Ernesto Osiris & Prince Nana) defeated The Bravado Brothers (Harlem Bravado & Lance Bravado). July 18, 2010–PWR: The Embassy (Mr. Ernesto Osiris & Prince Nana) defeated Grizzly Redwood & Mike Sydal. June 25, 2011–Best in the World: Homicide defeated Rhino w/Prince Nana. October 29, 2011–ICW: Julian Smokes and Ricky Reyes defeated Prince Nana and Xavier. December 16, 2012–Final Battle: RD Evans defeated Prince Nana. June 1, 2013–RCP: Prince Nana defeated Francis Kipland Stevens. July 13, 2013–RCP: RCP heavyweight champion King Mega defeated Prince Nana to retain the title. March 26, 2016–ROH TV (Taped): Donovan Dijak returned to ROH wrestling by attacking Jay Lethal & Truth Martini. Dijak was along side Prince Nana. Hey @PrinceKingNana you gonna be at SUSA today?